I have a rather ridiculous pile of children's books which have been arriving on my doorstep for the past few months. They arrived well in advance of their publishing release date and so I've been sitting on them, but the time has come to mention them to you! I'll lump 'um all in one post for convenience sake. We shall start with Shoe-la-la! which is recently been re-released in board book form. If you know me at all, you know that this is a rather weird title for me to be reading. But! There is a little girl in our home who is all pink and sparkles and SHOES! I accepted it for review for her sake. And I must note that I also only read it entirely for her sake. "Party dresses, party hair . . . Need new party shoes to wear!" This is how the book opens and it only goes uphill or downhill (your preference!) from there. 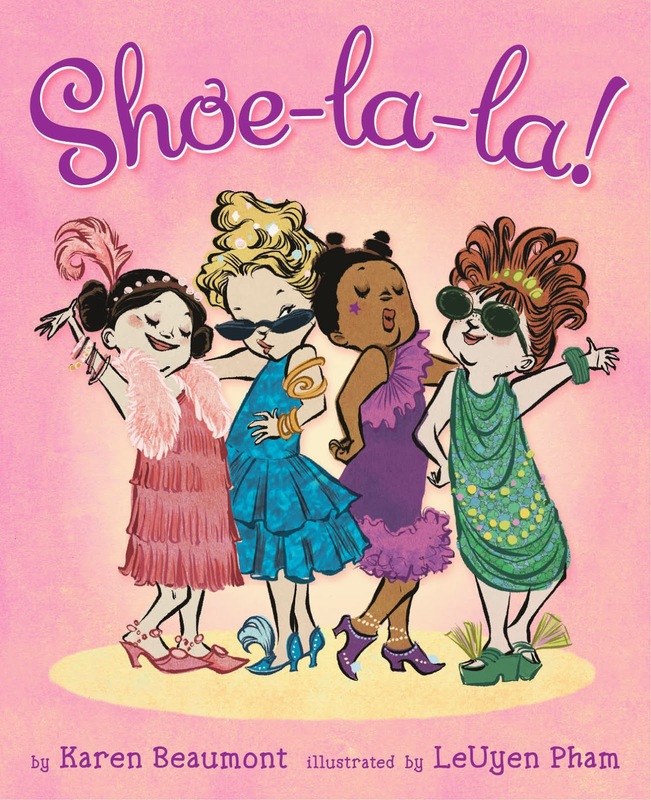 It's a rhyming picture book all about shoes. And there is glitter on the pages. My only strong objection to the book comes in the line which describes the girls finding shoes "to match my underwear" and, wouldn't you know it?, that's the most quotable line from the book! Naturally. So it's not my favorite to read. In fact, I only read it once. Other than that, she has flipped through the pages in awe and rapture. If you don't mind talk of underwear in your children's books, then you probably wouldn't have an objection to this one. I would rather that line have been left out. I think our kids deserve more of a reading challenge than laughing about underwear. There is more in life to think about. And laugh about. I have a friend whose motto is, "If it's not about elephants, it's irrelephant." I accepted this one for review for her sake. She's certain to get a kick out of this retelling of the Cinderella story. 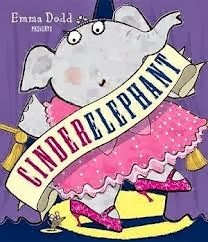 In this case, Cinderella is an elephant and she lives with her two ugly cousins, the Warty Sisters. They are horrible, mean and they smell bad. The story is predictable and the ending is happy. There is a prince. He marries Cinderelephant. I think this version is really, really cheesy myself. However, the aforementioned friend goes for cheese and so I think this book is perfection in that respect. The Gingerbread Bear is another take on the classic gingerbread man story. Only in this story there is a clever park ranger who lives with his wife and daughter in Woodlands National Park. One day the wife and daughter decide to make cookies and the girl asks for them to be shaped like a bear. You know how the story goes: the bear hops out of the oven alive and runs away from the family, campers in the park, a chipmunk, AND a wolf. Note: there once was a clever park ranger. 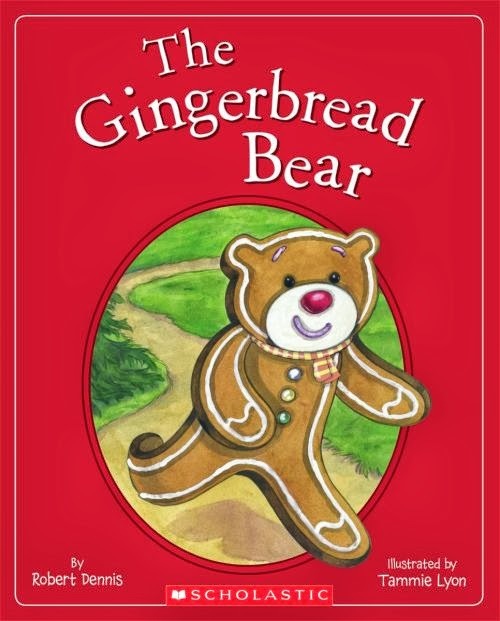 The gingerbread bear doesn't completely escape. Train , by Elisha Cooper, is, in my opinion, the best book in this stack. It was accepted for review for the pleasure of Bookworm2 who is our resident train lover. This book is lovely in both illustration and story. (Especially if you tire of reading Thomas books always.) It starts off with a commuter train carrying passengers out of the city. It moves on to a passenger train rolling out into the country. We also meet a freight train, an "overnight train" and a "High-Speed Train" as we move through the book. This book is pure satisfaction for Bookworm2 and I have no qualms reading it many times over. This book is a classic sort of picture book without frills and makes no attempt to be modern or "clever." 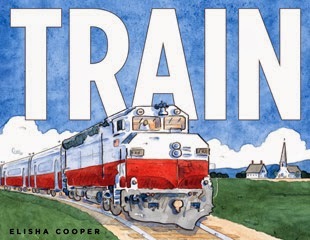 It's a very relaxing, happy book about trains and their various uses. We highly recommend this one! Lastly, I thought I would check out LEGO Star Wars: Empire Strikes Out because Bookworm1 is very much into Legos and is starting to get into Star Wars. I hadn't looked at any of the Lego picture books yet and this seemed liked a great opportunity to do so. 1. He's only seen the first movie and so I'm closely monitoring how much of the story he is exposed to so that he doesn't meet with any spoilers before he gets to see the final movie! (Irony: shielding your child from books so as not to spoil their movie experience. Wha. . . ?!) He saw the first movie for his birthday last October and he's gearing up to see the second (that would be Episode V for you old schoolers) this month. (In my mind there are no episodes I, II and III. I've convinced myself that they do not exist.) This book has spoilers. I told him he couldn't look at it yet. 2. I thought this book was just plain cheesy, full of snarky, cheap dialogue. I didn't care for the Lego girls with crushes on Luke Skywalker who are ooo-ing and awww-ing on the sidelines.. We're going to take a pass on these Lego picture books, I think and enjoy Legos for themselves. My genuine thanks to Scholastic for sending these books to us so that we might check them out. My little man would love the train book! We slowly introduced Star Wars to the oldest two boys. They had watched the first movie and then Joel and I went out one night. They conned the babysitter into letting them watch the next one. Talk about mad! Daddy and I were not pleased to miss out on watching it with them!! They have now watched all 6 movies. We began with the original 3 because we are old school as well. 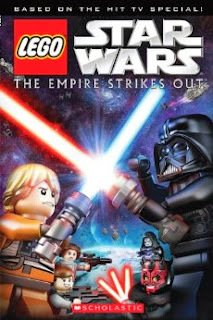 The Lego/Star Wars books aren't that great. BUT the giant coffee table style books that explain the ships and characters are fantastic! I recommend those when you are finished watching the movies. @Stephanie Kay - Ooooh ho ho! I would be so mad too! That's so disappointing! Stephanie Kay's story is awful! I understand the disclaimer thing, but yes, it does get a bit old. As a kid most, if not all of my books came from Scholastic Book Clubs. However, we are trying to buy less...spend less...esp on books and such. Used books are needed for us now. We like some of the Lego City books...but yes, some have cheesy dialogue. Good to know about those Lego story books - for future reference for the boy of course!